I sent 0.01047 BTC through coinpayments.net using electrum. First I selected minimum fee option, then I went back and selected one level higher as the fee tier. I also recognized at the above transaction link that one of the outputs is "unspent" and the other one "spent". Can someone explain to me what this is? Have I lost some of my bitcoins? The amount you sent (0.01047) plus transaction fee (0.00054597) totals 0.01101597. This is how much was spent from your wallet balance (0.09079308) leaving you with 0.07977711. You wallet balance consists of multiple bitcoin addresses. 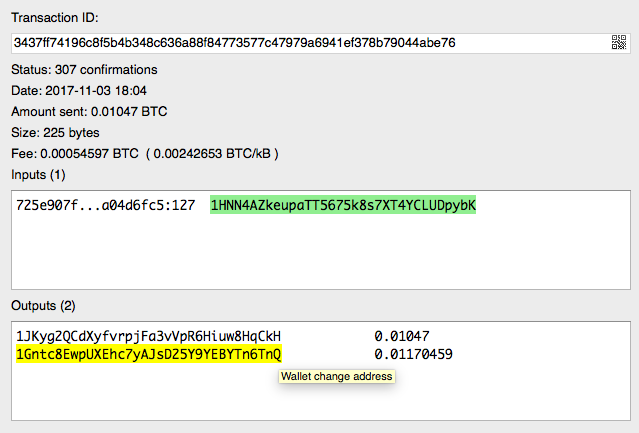 What you are seeing on Block Explorer is that one of the addresses in your wallet containing 0.02272056 was used, from which the transaction amount 0.01101597 was deducted, leaving 0.01170459, which was transferred to a different address back into your wallet. 1Gntc8EwpUXEhc7yAJsD25Y9YEBYTn6TnQ is a change address for your wallet - that balance is still yours. 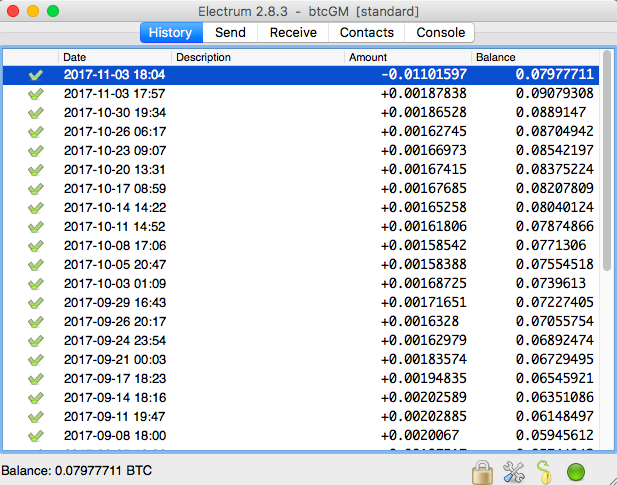 The main difference is that Electrum is showing you the total balance of your wallet, but Block Explorer is showing you only the balance of the individual bitcoin addresses from your wallet that were used to make the transaction, including the change going back into your wallet. Not the answer you're looking for? Browse other questions tagged transactions wallet electrum change blockexplorer or ask your own question.